Matt Waddup, UCU’s Head of Campaigns, has declared that he will be standing for General Secretary. He has been the main official responsible for implementing, or not, UCU policies since the union’s formation. In his election blog he argues that his is the ‘unity candidate’. He claims he would unite all the different ‘factions’ within the union. Nothing can be further from the truth. Waddup, by some margin, is in practice the most divisive GS candidate who has so far declared their intention to stand. Waddup, and some who have endorsed him, make a lot of the fact that he was redbaited in the Daily Mall for his role in the USS dispute. They do so to demonstrate how effective he had been and how he was the ‘mastermind’ behind the dispute. Redbaiting, however, is not something restricted to right wing papers like the Daily Mail. It has also been a long-term tactic used against Socialist activists in our union by Sally Hunt’s team with Waddup at the head. As a consequence, many members expressed concerns that the union would be vulnerable to attacks from the right-wing press who would use internal political differences to portray the union as divided. Indeed, this is exactly what happened when the Daily Mail attempted to redbait Waddup, Sally Hunt and lay activists during the USS dispute. As many of us warned, these attacks were extended across the union, with officials, left wing activists and even lay officers belonging to the right-wing group the Independent Broad Left (known for their passivity and timidity in the USS dispute as in other disputes) being portrayed as a militant left and smeared. Waddup’s blog and his supporters point to the fact that he was an official with the RMT union to demonstrate his supposed left wing and militant credentials. The truth is somewhat different. Waddup left the union immediately after Bob Crow was elected and joined the AUT, one of the forerunners of UCU. 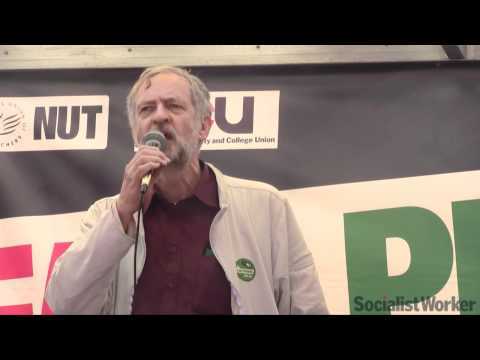 Waddup in fact had campaigned against Bob Crow and supported the right-wing candidate for General Secretary in the RMT. As for him masterminding the USS dispute, again the opposite is true. It was the supporters of UCU Left who had to push to get the union to take the attacks on the USS pension seriously, and it was UCU Left supporters who pushed for a strategy of escalating national strike action. During the last General Secretary election campaign in 2017, Jo McNeill repeatedly attacked Sally Hunt’s industrial strategy and in response to this, Hunt proposed an Effective Industrial Action Commission during her Congress speech in 2017. McNeill wrote an emergency motion to democratise the Commission which was carried and UCU Left mobilised candidates for election to the EIAC and won all but one seat. It was this left led commission which Waddup took minutes at, which lay the groundwork for what would become the most effective strike action in the history of the HE sector. Whilst Sally Hunt was the GS it was Waddup who was her key advisor. He pushed for the initial shockingly shabby compromise which took a huge rank and file members’ revolt outside Carlow Street to overturn to avoid a potential defeat. Waddup’s role in the USS dispute has not been the only example of his weak strategical and tactical acumen. The disastrous industrial action in the 2015-16 HE pay dispute was another. Waddup fully backed the proposals made by another leading official, Michael MacNeil, to pursue a strategy of 2-hour strikes (for which many members lost a whole day’s pay) and holding strikes on Saturdays and in the vacation period. These tactics were proposed on the grounds they would ‘confuse the employers’ but in fact they ended up confusing and infuriating the membership. The reason that the USS action was effective was because branch activists in the union ensured that it did not repeat the mistakes of summer 2016. Waddup’s vision for UCU is one that puts full time staff even more firmly in control of local and national disputes. For him effective organising is about full-time officials directing and controlling disputes and making sure that regional officials do what they are told by central office. At the last NEC on March 15th2019, Waddup proposed a paper setting out new criteria for indicative ballots. There is no legislation whatsoever on indicative ballots, they are not a legal requirement, they are as described, indicative and used only to take the temperature of members attitude towards action. However, Waddup’s proposal stated that all indicative ballots must be facilitated by officials in Carlow St, branches can run their own at present. The proposal also ties all indicative ballots into extreme time constraints, a ten day turnaround, which will make getting a 50% turnout, which Head Office regularly tell us they expect, extremely difficult. This proposal alone puts further, unnecessary constraints on branches ability to take industrial action and is an indicator of Waddup’s intention to move towards a more tightly top down controlled union. This paper was carried at NEC by a vote of 25:24 and will have to be overturned at Congress. When the union was first set up Waddup vigorously campaigned to dismantle the union’s regional lay member structures. He saw them as a threat to the centralised control of the full-time apparatus of the union. Although he did not succeed, he still views them as a block to his vision and ignores regions until he can abolish them. Waddup’s role in the walkouts and shut down of Congress 2018 also demonstrates his support for a highly centralised union structure where the notion that members might attempt to hold a GS to account plays no role. 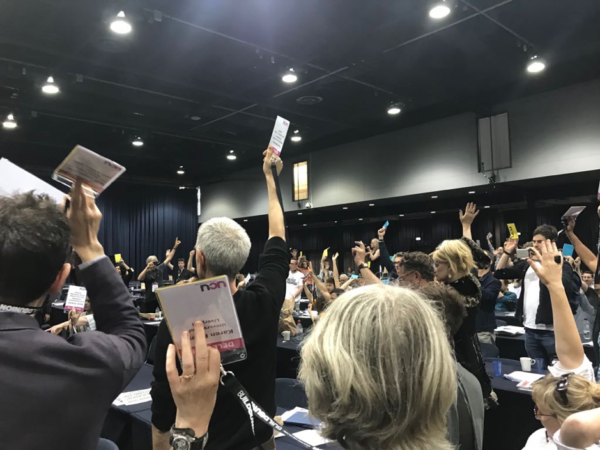 The debacle at Congress 2018 was an attempt by him and others to undermine UCU’s democratic structures by trying to block members from debating motions, democratically brought from their branches, criticising the role of the GS and himself for how they handled the USS dispute. Again, it took grass roots organising to defeat Waddup and his team. Waddup’s vision is a trade unionism that is primarily a professional exercise in organising and negotiating where members and branches are of secondary importance in winning disputes. For officials like Waddup, when members are called upon to fight back, they need to be controlled to ensure that they can be turned on and off like a tap. When UCU was formed some twelve years ago Waddup was forced to retreat from his centralised professional union model, effectively a servicing model, by the strength of the left. We proposed an alternative member-led, democratic and fighting trade unionism centred on inclusive campaigning against privatisation, casualization and the race to the bottom for pay and conditions. He now believes he can return to his project by becoming GS. It would be a huge step backwards for our members if this were to happen.